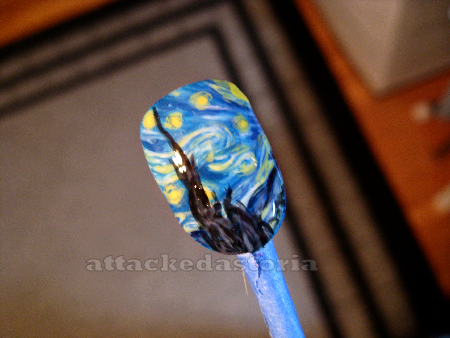 Attackedastoria Nails: Practice practice practice..
Just thought I'd show everyone what I've been practicing lately.. Starry Night is one of my favorite paintings, so by default it's one of my favorite nail designs! One day I'll get it down to the point where I'm totally satisfied, hopefully. I'm a perfectionist. Is there anything at all you guys would like to see me attempt? I always welcome ideas! This is amazing. Wow, I'm so impressed. That has to be insanely difficult to do in such a small space. This is one of my favorite paintings as well. Nicely done. This is the best nail art I've ever seen, hands down! This looks great! Really great! I think doing a set of them is an amazing idea... Can't wait to see more. o.O OMG! This looks so amazing!! Serously! Great job! WOW! That is awesome work! There are several Van Gogh inspired paintings in some eps. Would be fun nails, just saying. That is really gorgeous btw, I could never do that! I'm in awe! I also think that realistic fire is difficult to capture, but I think you are an amazing artist and could do it! That is seriously wavy! Love it! Wow, this is so awesome. You're incredibly talented! Wow, thanks so much for all the comments and kind words, everyone! I appreciate it. This was fun to do, unfortunately I'm slacking on finishing the set, lol. I'm not sure how I'd do a tutorial for this as it's a little too complicated to show in just pictures, and my video setting isn't too great.. but I'll think of something! Thank you! All I use are little paintbrushes. For now I'm just using cheap craft store brushes that I trim down to get to the size I want.